Damian Lillard posts 33 points and Jusuf Nurkic notches his first career triple-double as Portland takes it, 129-112. James Harden notches a triple-double with 43points, 10 rebounds, and 12 assists to lead Houston over Cleveland. Josh Richardson scores 24 points as seven different Miami Heat players score in double digits, beating the Cavaliers 117-92. Tristan Thompson grabs the steal to start the fast break, then finishes it with a dunk. Played in 82 games (33 starts) with Cleveland…averaged 7.9 points on a career-best .588 shooting from the field and 9.0 rebounds in 27.7 minutes…was tied for second in the NBA in offensive rebounds (268) and tied for seventh in offensive rebounds per game (3.3)…played in all 82 games for the fourth consecutive season, increasing his consecutive games streak to 370 dating back to Feb. 10, 2012; the longest active streak in the NBA and longest in Cavailiers history…his .588 field goal percentage was the second-highest all-time for any Cavalier who made a minimum of 200 field goals…pulled down double-digit rebounds in a team-high 43 games, including 15 or more rebounds in five games…grabbed five offensive rebounds on 18 occasions, including a season-high 11 offensive rebounds against Oklahoma City on Dec. 17; his 11 offensive rebounds was one shy of tying a franchise record for most offensive rebounds in a game…recorded 10 or more defensive rebounds in seven contests, including at least 11 in three games…scored in double figures 32 times, including seven contests with 15 or more points…recorded 23 double-doubles; notched 11 double-doubles as a reserve, which was third-most in the NBA…recorded a season-high three blocks four times…in 48 games as a reserve, averaged 7.6 points on .587 shooting and 8.5 rebounds in 25.2 minutes…among all NBA players who came off the bench at least 40 times this past season, ranked first in rebounds per game (8.5), first in offensive rebounds per game (3.0), first in defensive rebounds per game (5.5) and third in double-doubles (11)…in 34 games as a starter, averaged 8.2 points, on .590 shooting and 9.7 rebounds in 31.2 minutes, including 12 double-doubles…registered 16 points on 7-8 (.875) shooting, to go along with eight rebounds and two steals in 30 minutes against Indiana on Nov. 8; passed Phil Hubbard (1,051) for the seventh-most offensive rebounds in Cavaliers history with his third offensive rebound of the night…appeared in his 300th consecutive regular season game on Nov. 19 against Milwaukee, joining Jim Chones (361), Austin Carr (351) and Danny Ferry (301) as the fourth player in Cavaliers history to play in 300 straight regular season contests…surpassed Larry Nance (1,067) for sixth-most offensive rebounds in Cavaliers history on Nov. 21 against Atlanta; registered a season-high 16 rebounds (six offensive), to go along with nine points, a career-high tying five assists and two blocks in 40 minutes that night…recorded a season-high 19 points on 8-10 (.800) shooting, 12 rebounds and two assists in 34 minutes against Minnesota on Jan. 25…pulled down his 3,000th career rebound against San Antonio on Jan. 30; became the 10th player in franchise history to reach that plateau…moved into 9th place in Cavs history for defensive rebounds, passing Tyrone Hill (1,830) against Boston on Feb. 5...moved past Brad Daugherty (1,207) for 5th place in Cavaliers history in most offensive rebounds against Sacramento on Feb. 8…passed Bingo Smith (3,057) for 9th place in franchise history for most rebounds against the L.A. Clippers on Feb. 10; finished the contest with 15 points, on a perfect 6-6 (1.000) shooting from the floor and a game-high 13 rebounds (seven offensive) in 34 minutes…posted 18 points on 6-8 (.750) shooting from the field and 15 rebounds (seven offensive) in 37 minutes at Sacramento on March 9…posted 11 points, 15 rebounds, a career-high tying four steals and two blocks in 28 minutes off the bench at Orlando on March 18; had nine points, 10 rebounds, three steals and two blocks in the fourth quarter, which was the second time in his career he recorded double-digit rebounds in a quarter (March 1, 2015 at Houston, 10 rebounds in fourth quarter)…played in his 362nd consecutive game, passing Jim Chones (361) for longest streak in team history against Houston on March 29; recorded 16 points on 4-8 (.500) shooting, including an 8-9 (.889) clip from the foul line, and 10 rebounds in 39 minutes; His .889 shooting from the foul line was his highest free throw percentage with at least nine attempts since going 9-10 (.900) against Toronto on March 25, 2014…moved past Jim Brewer (1,292) for 4th place in offensive rebounds against Charlotte on April 3…became the 9th player in Cavaliers history to pull down 2,000 defensive rebounds against Atlanta on April 11…led or tied for the team lead in rebounds 30 times, blocks 21 times and steals 11 times. Owns career averages of 9.7 points on .502 shooting and 8.5 rebounds in 28.5 minutes per game in 388 games (238 starts) over five seasons with Cleveland…has played in 370 consecutive regular season games dating back to Feb. 10, 2012, the longest active streak in the NBA and longest in Cavaliers history…played in 82 games (15 starts) for the Cleveland Cavaliers in 2014-15…averaged 8.5 points on a career-best .547 shooting from the field and 8.0 rebounds in 26.8 minutes per game…ranked fifth in the NBA in total offensive rebounds (274) and fifth in offensive rebounds per game (3.3)…played in all 82 games for the third straight season, increasing his consecutive games streak to 288 dating back to Feb. 10, 2012; it is the second-longest streak in the NBA going into 2015-16 (DeAndre Jordan-322)…scored in double figures on 33 occasions, including two games with 20 or more points…pulled down at least 10 rebounds in 28 games, including three games with 15 or more rebounds (all off the bench)…recorded 14 double-doubles, while tying for the NBA-lead in double-doubles off the bench with eight…had 20 games with at least five offensive rebounds, and two games with 10 or more offensive rebounds…in 15 games as a starter, averaged 12.6 points on .545 shooting and 9.7 rebounds in 35.7 minutes, to go along with six double-doubles…in 67 games as a reserve, averaged 7.5 points on .548 shooting from the field and 7.6 rebounds in 24.7 minutes…led all NBA bench players in total rebounds (511) and offensive rebounds per game (3.2), while ranking second in total rebounds per game (7.6)…his 7.6 rebounds per game off the bench was the highest by a Cavs reserve since John Williams (7.7) in 1989-90 (minimum 50 games off bench)…grabbed a franchise-record tying 12 offensive rebounds to go along with 16 points, 13 total rebounds and two blocks in 36 minutes at Chicago on Oct. 31, becoming the first Cavs player to ever record 12 offensive rebounds as a bench player; the previous high for a Cavs reserve was 10 by Kenny Carr (11/28/79) and John Williams (12/11/91)…grabbed his 2,000th career rebound vs. Orlando on Nov. 24…made his 1,000th career field goal with his third make against Indiana on Nov. 29…tallied 21 points and 14 rebounds (nine offensive) in 33 minutes off the bench at Toronto on Dec. 5; the last Cavs player to tally at least 21 points and 14 rebounds off the bench was Ben Poquette, who did it on Jan. 26, 1985 against Denver (22 points, 14 rebounds)…moved into 10th place in Cavaliers history in offensive rebounds with his 825th career offensive rebound, surpassing Drew Gooden (824) on Dec. 8 at Brooklyn…blocked his 200th career shot and grabbed his 900th career offensive rebound against Houston on Jan. 7…moved into 9th place in Cavaliers history in offensive rebounds with his 956th career offensive rebound, surpassing Tyrone Hill (955) on Feb. 5 vs. L.A. Clippers…recorded a season-high 24 points on 10-12 (.833) shooting, 12 rebounds and two blocks in 40 minutes at L.A. Clippers on Jan. 16; the last Cavs player to shoot at least .833 from the field while recording at least 24 points and 12 rebounds was J.J. Hickson (24 pts/14 rebs) on Jan. 28, 2011 vs. Denver…in a win over Oklahoma City on Jan. 25, became the first Cavs bench player to tally 10 points, 16 rebounds and three blocks since April 19, 2006 when Anderson Varejao did so against Atlanta (14 pts/18 rebs/3 blks); also had a season-high 11 defensive rebounds…tied his career high with four blocks at Minnesota on Jan. 31…posted 14 points and 19 rebounds (11 offensive) and two steals in 37 minutes off the bench at Houston on March 1; became the first Cavs player to tally 14 points and 19 rebounds off the bench since Jim Chones (18 points and 19 rebounds) on Oct. 18, 1974 at Portland (4 overtimes)…was the ninth player in Cavaliers history to grab 1,000 offensive rebounds with his first of four offensive boards in a road win over San Antonio on March 12; also topped the 3,000 career point plateau that night after a 12-point, 9-rebound performance…averaged 9.1 points and 9.3 rebounds during a 35-game stretch from Dec. 23-March 1…played in his 300th career game against Miami on April 2 …led or tied for the team lead in rebounds 25 times, blocks 23 times and steals seven times…played in 82 games (all starts) for the Cavaliers in 2013-14…averaged 11.7 points on .477 shooting and 9.2 rebounds in 31.6 minutes…recorded a career-high 36 double-doubles on the season, the most by a Cavs player since Drew Gooden in 2004-05 (37)…was tied for fifth in the Eastern Conference in double-doubles (tied-13th in NBA), while also ranking seventh in rebounds per game (9.2, 19th in NBA) and third in offensive rebounds per game (3.3, sixth in NBA)…his 269 total offensive rebounds were the fifth-most in the NBA…became the fifth player in Cavaliers history to have two seasons of at least 30 double-doubles (B. Daugherty, T. Hill, L. James and S. Kemp)…notched four straight double-doubles on two occasions (Jan. 14-20 and Feb. 11-19)…pulled down at least 10 rebounds 42 times on the season…played in his 200th consecutive game on April 2 at Orlando and posted 20 points on 6-10 (.600) shooting, including a perfect 8-8 mark from the foul line, a game-high 11 rebounds and two steals in 32 minutes…tallied a season-high 25 points (14 in the 4th quarter) on 12-16 (.750) shooting and a game-high 15 rebounds (six offensive) in 34 minutes at Detroit on Feb. 12…his 14 points in the fourth quarter against the Pistons were the most he’s scored in a period in his career…recorded 20 points on a season-high percentage of .889 (8-9) shooting from the field, 10 rebounds and two blocks in 37 minutes of a win at Denver on Jan. 17…finished with 18 points on 9-12 (.750) shooting, a game-high 15 rebounds (five offensive) and two assists in 35 minutes at Utah on Jan. 10…had 20 points, 13 rebounds, four assists, two steals and one block in 40 minutes versus the L.A. Clippers on Dec. 7…in a win over Denver on Dec. 4, finished with 17 points, a career-high 21 rebounds (13 in the first half) and a season-high three blocks…the only other player in Cavaliers history with a game in which he equaled or exceeded Thompson's totals in each of those categories (since the NBA began tracking blocked shots in 1973-74) is Cliff Robinson, who had three such games for Cleveland (two in 1982-83 and one the following season)…notched his fourth straight double-double with 16 points and a game-high 14 rebounds (career-high 13 defensive) in 39 minutes versus Orlando on Feb. 19…matched his career-high with five assists to go along with 11 points and 11 rebounds in 36 minutes at Oklahoma City on Feb. 26…recorded his first double-double of the season with 21 points and a game-high 11 rebounds, to go along with a career-high tying nine free throws made (on 10 attempts) in 35 minutes at Charlotte on Nov. 1…registered seven double-doubles in the first 11 games of the season, becoming the first Cavs player to notch seven double-doubles in the Cavaliers’ first 11 games of a season since Zydrunas Ilgauskas, who had eight double-doubles through the first 11 games of the 2007-08 campaign…was one of only four players in the Eastern Conference to start in all 82 games (Jeff Green, Greg Monroe, John Wall)…scored 10-19 points 50 times and 20 or more points six times…led or tied for the team lead in rebounds 39 times, blocks 17 times, steals 11 times and scoring three times…played in 82 games (all starts) during the 2012-13 season…averaged 11.7 points on .488 shooting, 9.4 rebounds and 0.9 blocks in 31.3 minutes…averaged 3.7 offensive rebounds per game, which ranked 5th in the NBA and first among second year players …set the Cavaliers franchise record for most offensive rebounds in a single season with 306 (2nd in the NBA), surpassing Zydrunas Ilgauskas’ 299 offensive rebounds in the 2004-05 season…pulled down at least four offensive rebounds in 42 games and at least 10 total rebounds 38 times…grabbed 773 total rebounds on the year, passing Tyrone Hill (765) for 10th-most in a single season in Cavaliers history… recorded a team-high 31 double-doubles on the season, becoming just the ninth player in franchise history to total at least 30 double-doubles in a single season…shot 8-10 (.800) from the field and finished with 19 points and 13 rebounds at Charlotte on Jan. 4…tallied 21 points, nine rebounds and a career-high tying five assists in 40 minutes versus Boston on Jan. 22…over the last 56 games of the season, posted 26 double-doubles and averaged 13.2 points and 10.3 rebounds in 32.2 minutes per game during that stretch…finished with 20 points on 9-16 (.563) shooting, 11 rebounds and two blocks in 32 minutes against Indiana on March 18…recorded a career-high 29 points on 10-17 (.588) shooting and a career-high 17 rebounds, while shooting a perfect 9-9 from the foul line in 41 minutes at Boston on April 5, becoming the only player in Cavaliers history to ever score 29 points, grab 17 rebounds and make at least nine free throws without a miss in a single game…scored in double figures in a career-best 20 straight games from Jan. 4-Feb. 13, averaging 15.2 points on .535 shooting, 9.8 rebounds, 1.0 steal and 1.0 block, while shooting .726 from the foul line in 32.9 minutes over that stretch…scored 20 points on 9-10 (.900) shooting for Team Chuck in the BBVA Rising Stars Challenge at All-Star Weekend…posted four consecutive double-doubles twice (Dec. 19-26 and March 6-12)…scored 10-19 points 56 times and 20 or more points three times…led the team in scoring five times, rebounds 45 times, steals 12 times and blocks 33 times…one of two Cavs players to start every game during the regular season…also one of 15 players in the NBA to start all 82 games on the year…played in 60 games (25 starts) during the 2011-12 season…averaged 8.2 points on .439 shooting, 6.5 rebounds and 1.0 block in 23.7 minutes…as a starter, averaged 10.4 points on .470 shooting and 7.5 rebounds (3.8 offensive) in 28.8 minutes…averaged 3.1 offensive rebounds per game, which ranked 12th in the NBA and first among rookies…ranked second in rebounds per game, third in blocks per game and third in double-doubles among rookies…scored a career-high 27 points on 12-16 (.750) shooting while adding 12 rebounds at New Jersey on Mar. 19, becoming just one of two rookies (Kenneth Faried) to record a game with at least 27 points and 12 rebounds for the season...grabbed a season-best 15 rebounds and added 15 points on 7-12 (.583) shooting at New Jersey on April 8…came off the bench to score 16 points and pull down nine rebounds (five offensive) in 24 minutes against the Bobcats on Jan. 3…scored 15 points and grabbed 12 rebounds (seven offensive) in 30 minutes against Sacramento on Feb. 19…scored 20 points on 10-11 (.909) shooting in the BBVA Rising Stars Challenge at All-Star Weekend…recorded nine double-doubles on the season…scored 10-19 points 23 times and 20 or more points once…led the team in scoring twice, rebounds 19 times, steals five times and blocks 26 times…missed games from Jan. 24-25 and Feb. 3-8 with a left ankle sprain…was placed on the Inactive List seven times for the season. In 41 career postseason games (36 starts), holds averages of 8.1 points on .545 shooting from the field, 9.9 rebounds and 1.0 block in 32.9 minutes…started in all 21 games during Cleveland’s championship run in the 2016 Playoffs…averaged 6.7 points on .527 shooting and 9.0 rebounds (4.1 offensive) in 29.6 minutes…pulled down at least five offensive boards on eight occasions, including a playoff career-high nine offensive rebounds at Atlanta on May 6…in the Conference Semifinals against Atlanta, averaged 6.3 points, 11.0 rebounds (team-high 6.0 offensive) and a team-high 1.3 blocks in 29.3 minutes…in the Eastern Conference Finals versus Toronto, averaged 4.7 points and 8.5 rebounds in 27.7 minutes…during the 2016 NBA Finals, had three double-doubles and averaged 10.3 points on .636 (28-44) shooting from the field and 10.1 rebounds in 32.3 minutes…had a 2016 playoff-high 15 points on a perfect 6-6 from the field, a 2016 playoff-high 16 rebounds (playoff career-high 14 defensive) and a playoff career-high three assists in 43 minutes during Game 6 of the NBA Finals versus Golden State on June 16…made his postseason debut in the 2015 Playoffs, playing in all 20 games (15 starts) during Cleveland’s NBA Finals run…averaged 9.6 points on .558 shooting, 10.8 rebounds and 1.2 blocks in 36.4 minutes per game…as a starter, posted nine double-doubles and averaged 10.6 points on .549 shooting, 12.1 rebounds and 1.3 blocks in 39.2 minutes…in the Eastern Conference Semifinals against Chicago, averaged 9.3 points, a team-high 11.2 rebounds and 1.5 blocks in 37.0 minutes per game…in the Game 6 victory against Chicago on May 14, tallied 13 points, 17 rebounds (six offensive) and two blocks in 40 minutes of work; became just the third Cavs player to put up at least 13 points, 17 rebounds and two blocks in a playoff game in team history (Brad Daugherty on 5/9/93 vs. NJ and Zydrunas Ilgauskas on 4/30/07 vs. WAS)…during the Eastern Conference Finals against Atlanta, averaged 11.8 points on .643 shooting, 11.0 rebounds and 1.8 blocks in 39.3 minutes…pulled down 16 rebounds (five offensive) and added seven points and two blocks in 41 minutes at Atlanta in Game 2 of the Eastern Conference Finals on May 22… during the 2015 NBA Finals against Golden State, averaged 13.0 rebounds to go along with 10.0 points and 1.0 block in 41.2 minutes per game…grabbed double-digit rebounds in all six Finals games, posting four double-doubles...scored a playoff career-best 19 points on 6-11 (.545) shooting, 10 rebounds, two steals and two blocks in 40 minutes at Golden State in Game 5 of the NBA Finals on June 14. NBA Champion (2016)…participated in the 2013 BBVA Rising Stars Challenge at All-Star Weekend…named to the NBA’s All Rookie Second Team for the 2011-12 season. 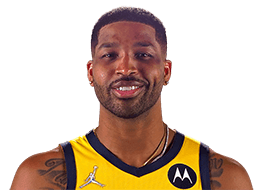 Full name is Tristan Trevor James Thompson…son of Trevor and Andrea Thompson…a native of Toronto, Canada…McDonald’s All-American as a high school senior and member of the World Select Team at the 2010 Nike Hoop Summit…played for Team Canada in the FIBA Americas Tournament in Caracas, Venezuela during the summer of 2013... favorite food is chicken teriyaki…his first job was a paper boy…favorite sport other than basketball is football…favorite TV show is Martin…favorite movie is Coming to America…favorite game is Monopoly. Played one season at Texas…in 36 games (34 starts), averaged 13.1 points on .546 shooting, 7.8 rebounds and 2.4 blocks…ranked second on Texas in scoring (13.1 ppg) and led the team in rebounding (7.8 rpg), blocked shots (86), doubles-doubles (10) and field goal percentage (.546)…named The Big 12 Freshman of the Year…ranked 24th in the nation in blocks per game (2.4) in 2010-11…posted a season-high 26 points, grabbed 10 rebounds and finished with three blocks versus Kansas State…in his first college start, recorded 20 points, seven rebounds, five blocks, a season-high four assists and three steals versus Illinois...notched a personal-best 15 rebounds at Michigan.